I have added some Permanent Alizarin Crimson to the apple and napkin. Alizarin Crimson is a cool red, so it works especially well in the shadow areas. 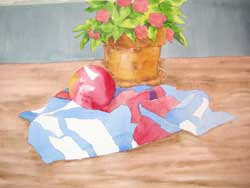 I have glazed the red over the blue in a small area of the napkin to the right of the apple. I will do more glazing on the napkin soon.